The concept of sorcery or ceremonial magic being placed at the service of military or political interests figures prominently in myth and legend. Hence we find Merlin offering magical aid and advice to King Arthur and the Knights of the Round Table, and the lesser known Malagiggi at the side of Charlemagne. These legendary wizards performed multiple services: espionage through what we would nowadays term "remote viewing", the summoning of paranormal forces to tip the balance of a battle, and perhaps more importantly, the ability to predict the outcome of a given situation. The sorcerer's role in myth was continued by novelists of heroic fantasy, and writings of this kind can be found on bookshelves to this very day. Historical sources point to the reality of such sorcerers: The emperor Marcus Aurelius, for example, was accompanied by a mage known as Julian the Theurgist in his campaigns against the Marcomanni and the Quadii in 174 C.E. This sorcerer was allegedly able to cast thunderbolts and create rain. On this specific occasion, Julian created a phenomenon called an iunx to cause rainstorm that served to slake the thirst of the Roman army and to drive off the terrified Marcommani. References to "the miracle of the rain" can be found in most classic sources, although some sources attribute the phenomenon to the workings of an Egyptian sorcerer named Arnouphis. But was there ever any truth to the prominent role played by users of magic during the Middle Ages? Modern readers have certainly come to known about the "Burning Times" when practitioners of magic in Western Europe were burned at the stake in late medieval times. Yet was this the same case in Eastern Europe, or in the Near East, or North Africa? Was the use of magic allowed, or even sanctioned, by the political and religious elite of the time? We have come to understand this age of iron as a succession of battles in which there was little time for pursuits other than war. Some sources tell us, however, that the study of paranormal forces was alive and well at the time and being actively employed. During the siege of Jerusalem, there were reports that the Muslim defenders were employing the services of sorceresses against the Christian attackers. One chronicle mentions that Raymond of Aguilers, a French Knight, noticed that witchcraft was being employed against the besiegers. 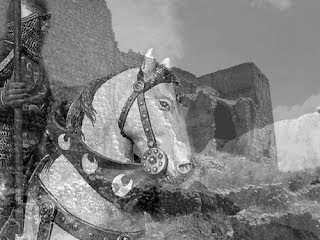 Two witches, says the account, were standing on the parapets casting spells on one of the Crusader siege engines. Their magic must not have been quite as powerful as they had hoped, since the sorceresses were killed by a stone hurled by one of the catapults. Aguilers mentions in passing that the use of witchcraft was forbidden to the Crusaders on their "holy endeavor". This raises interesting possibilities. Did Medieval armies employ the services of such sorcerers or enchanters regularly? Was there, as in heroic fantasy novels, a wizard methodically rubbing his temples as he cast spells for his employer's side? There can be no doubt of the existence of sorcery in the Islamic world at the time, since the pre-Islamic Arabian peninsula had been awash with magic potions, amulets and powerful talismans, and the belief in efreeti and djinns. These practices existed during the Caliphate and appear to ignore the Koranic ban on such practices. Arabic authors such as Albumassar wrote treatises on the occult which would later be cited by Western practitioners of the art, and even the famous 10th encyclopedia known as the Firhest (Kitab-Firhist) dwells on sorcerous subjects, mostly quoting older magical works from Babylonian, Syrian and Persian sources. The great magician and alchemist Surawardi, who established the "illuminationist" branch of Sufism, ran afoul of the legendary Sultan Saladin ibn Yusuf of Egypt, the Crusaders' main adversary, and summarily executed. The reason for Saladin's had nothing to do with Surawardi's use of magic or his alchemical experiments--one of Saladin's sons was showing signs of fascination with the Sufi's teachings, and the Sultan feared the he might become a heretic. No less strict than Christianity in this regard, Islam officially banned the use of magic, declaring it haram (forbidden) to practice it, seek advice from those who used it, and much less try to seek a sorcerer's aid to affect the material world. Even money and material possessions obtained through magic (such as the three wishes traditionally granted by a genie) would cause the recipient to fall under a ban. Islamic religious texts offer a curious explanation as to how black magic came into the world: at the time of King Solomon, a pair of angels descended to earth and imparted the knowledge to those who asked to learn it, after cautioning their would-be pupils that listening to their tuition would cause disbelief in Allah, resulting in a situation likened to the "estrangement between a man and a woman." It was also believed in the Medieval Islamic world that practitioners of the black arts could not cause harm to their fellow men "unless Allah allowed it" for one reason or another. The Islamic view of the sorcerer was that of a man or woman bent on aiding Satan's work in the world--a belief echoed centuries earlier in Zoroastrianism--and in harming humankind, Allah's creation. As protection against the sorcerer's wiles, the faithful were encouraged to recite certain suras and to give alms to the poor on a regular basis, aside from wearing certain passages from the Koran, written on deer hide, and pinned inside their clothes close to the skin. Given their origin in the holy book, these passages did not fall under the category of charms, which are also proscribed by Islam. Parapsychologists will perhaps find it interesting that Islam offered a special charm "against djinn that throw stones at one's home". The victim of this poltergeistic phenomenon were asked to pick up one of the stones and say aloud: "Allah is sufficient and satisfying for me. Allah hears the call of whosoever calls. There is no one and nothing as the ultimate save Allah." Perhaps as obsessed as their Byzantine adversaries over the effects of the evil eye, Muslims were advised to recite the eighty-seventh verse of the al-Anbiya over a hundred times. Perhaps Raymond of Aguilers was being disingenuous when he spoke of the ban on the use of witchcraft by Crusaders. It is almost certain that many of the warriors standing outside Jerusalem, or trying to scale its walls, or manning siege towers, were emboldened by the sense of invulnerability conferred by the chemise de necessité (literally, "shirt of need") worn under their hauberks. This garment, which allegedly offered magical protection against weapons, was able to deflect sword blows and arrow heads. It had to be woven by a virgin during a single night of Christmas week, while uttering a series of charms. If properly made, the garment would even be able to render the wearer invisible. European sorcerers of the crusading age were supposedly able to cast magic arrows directed by elementals or other entities under the magicians' control. These paranormal bowmen, known as sagittarians, were a source of understandable fear on the medieval battlefield. The monks and religious men of Christendom often entertained demons, obtaining critical information from them: the abbot Trithemius was accused of being a necromancer for summoning up Emperor Maximilian's late wife. The Pope himself was supposed to have a terrible power reserved to him, known as "the shadow of the blessing", often represented as the dark side of the papal hand raised in benediction, casting the shadow of a horned figure. Pope Silvester II, a brilliant scholar, reputedly confessed to the College of Cardinals his dealings with the dark forces. Prior to this time, Pope Leo the Great had collected an assortment of charms and spells into a work known as the Enchiridion, which was presented to Charlemagne in appreciation for the Frankish ruler's defense of the papacy. When the Templars were finally prosecuted by the kings of France and their arrest decreed throughout most of Western Europe, a number of remarkable stories began to emerge, among them the belief that the warrior-monks had given themselves over to devil-worship. The religious order was also accused of keeping a number of "talking heads" employed for divination and darker purposes. Perhaps the best known among them was the "idol" Baphomet, allegedly worshipped by the Templars in their ceremonies. This oracular statue, according to the inquisitors who singlehandedly destroyed the order, was proof positive of the Templar's league with the devil. Efforts at securing this damning evidence failed miserably, and the "talking heads" remain just another tantalizing piece of Templar mystery. However, in May 1308, Guillaume Pidoye, a seneschal and custodian of the Templar chapterhouse in Paris, surrendered to the Inquisition a number of statues in his custody. According to the records, a large head depicting a woman--made of gilded silver and bearing the legend "Caput LVIII", was presented to the authorities. It is surprising that the Church would have leveled such an accusation against the Templars when other "heads"--made of brass and used for oracular purposes--had been in possession of the Bishop of Lincoln and his student, the friar Roger Bacon. Strange events also befell the Crusaders in the Near East: the late Andreas Faber Kaiser mentions what we could now call a high-strangeness incident which transpired during the siege of Antioch in 1099. Montcada, was a Spanish knight from the city of Barcelona. He had joined the First Crusade and was making full display of his puissance in battle at the walls of the fabled city of Antioch was knocked from his horse by a Saracen warrior. Surrounded by foes, Montcada prayed to St. George, the patron saint of warriors, and a magnificent white horse galloped toward him in the midst of the fight. Since it was customary for warriors to re-horse themselves in mid-battle with steeds taken from the enemy, Montcada assumed that the horse belonged to some Saracen emir who had met his demise. The knight pulled himself onto the horse's back and charged against the city's walls, "landing a mighty blow against it with his sword, cracking it and opening a breach," according to the original text. Followed by footsoldiers, Montcada charged into the streets of beseiged Antioch. The Spanish warrior experienced momentary confusion as he realized that he was not facing the glories of an oriental city, but the common, drab houses of a medieval European one. The men in arms surrounding him were not the motley assorment of French and German soldiery of the Crusader army, but rather wore the clothing and devices of his own country, and more importantly, spoke his own language: Montcada realized that he was in the city of Alcoraz, a Moorish stronghold in the Iberian peninsula, beseiged by James, the king of Aragon. As swift as thought, the white steed had borne him across the Mediterranean to his homeland, where his sword was needed most. While this story can be dismissed as forming part of the heroic vein of medieval lore, which would later give rise to the chansons de geste, the 13th century chronicle Crónica del rei Jaume records the event: "As the Saracens themselves told us, they witnessed the entrance of a knight in white armor on a white steed, and we think it may have been St. George..."
Faber Kaiser's impression was that the events surrounding the teleportation of the noble Montcada were similar to those involving the alleged teleportation of a 16th century soldier from Manila to Mexico City. Of such things are legends made. In getting to the Holy Land, the Crusaders had traversed the Balkans and therefore, entered the domains of the powerful Eastern Roman Empire, better known to us as the Byzantine Empire, although its inhabitants would have balked at the suggestion of being called anything other than Romans. This surviving half of the ancient Roman Empire, although much reduced in size by constant wars against the Islamic Caliphates, was still reckoned as the Mediterranean's superpower, with huge mercenary armies and a powerful navy, commanded from the splendid city of Constantinople. The French and German knights who formed the backbone of the Crusades felt both awe and loathing for Byzantium as a culture and as a political entity--despite the fact that their reason for having gone to the east stemmed from a request by the Byzantine emperor Alexius Comnenus for troops needed to fight the Turkish sultans. The Christian Empire of Byzantium, despite being organized as a strict theocracy, offered a certain amount of "wiggle room" for the remnants of paganism to flourish along with the practice of ceremonial magic. This was a holdover from Imperial Rome, when the state either sponsored or persecuted sorcery as the political winds or imperial whim dictated. Belief in the supernatural was rife throughout the empire. It was believed that the emperor Justinian had sold his soul to the Devil and could be seen wandering the palace grounds at night, carrying his head in his hands; the arch-fiend had attacked the bishop Parthenius in the guise of an enormous black dog on the palace grounds. Demons allegedly aided the scholar Michael Sicidites in making things invisible or playing spellbinding tricks, and that one of the early patriarchs of the church, John the Grammarian, had held séances in which nuns were employed as mediums. What we know about these forbidden practices comes largely from the work of the 11th century Byzantine chronicler Michael Psellos, one of the first of the of the paranormal and a demonologist as well. His work, the Chronography, describes how the Empress Zoe (1028-1050 C.E.) had an image of Christ which would change colors to forecast the future--the inspiration for "mirror, mirror on the wall"?--and other oracular purposes. Byzantium, the world's greatest repository of relics (most of them fraudulent), sanctioned the belief in miracles and supernatural intervention by "holy" forces, such as the procession of icons along the walls of Constantinople, which saved the city from enemy attacks twice in its history, or so thought the population. But the population made equal use of amulets and charms which flew in the face of official policy, which banned witchcraft of any kind. Perhaps more than any other Mediterranean nation, the Byzantines feared the evil eye and its consequences. In his paper Reactions of Two Byzantine Intellectuals to the Theory and Practice of Magic, scholar John Duffy mentions that the use of amulets was widespread in the early days of the Empire, when churchmen such as St. John Chrysostom railed against the populace for placing chains of coins with the image of Alexander of Macedon around their heads to ward off evil. But even the impassioned speeches by the golden-tongued father of the Eastern Church failed to separate the population from its belief in charms, and two centuries later, writes Duffy, people still wore tunics adorned with images of Alexander on horseback as a safeguard against evildoers. As the vestiges of paganism were snuffed out, the amulets and tokens reflecting pagan deities and monsters (such as Medusa, employed as protection during childbirth) were replaced by medals of Christian saints, crosses and icons. But even then, the average man who feared the jealousy of his peers or encounters with evil creatures on lonely roads might carry a parchment amulet pinned inside his clothes, safe from any prying eyes. A gold coin of the Emperor Constantine the Great, with his mother Queen Helena on the reverse side, was extolled by the chronicler Michael Italikos as being "invested with an ineffable power" and therefore capable of warding its possessor against illness. Nor was divination shunned by the Byzantines: the emperor Leo the Wise antedated Nostradamus by almost four hundred years, allegedly making accurate predictions of the Empire's future, in verse form, right up to the conquest of Constantinople by Venetian and French forces in the early thirteenth century. Eminent historian Sir Steven Runciman writes that the Byzantines expressed the belief that the lives of important personages could be somehow bound to a given physical object--a stoicheion--and harming the physical object would bring harm, almost in voodoo doll fashion, to the indiviudal. Runciman relates the story of how a monk told the emperor Romanus I that a certain stone pillar was the stoicheion of the Bulgarian king Symeon. The emperor did not wait to have his soldiers topple the otherwise harmless column, and word was eventually received in Constantinople that the elderly Bulgarian ruler had died. Perhaps it was because Byzantium was so torn apart by religious dissent that the government never had the time to chase practitioners of sorcery, as would occur in the West in later centuries. While Imperial authorities had enacted strict anti-sorcery legislation in the early days, magic-use was no longer seen as a political matter by the time the Crusades developed. Religious authorities under the Patriarch of Constantinople could deal with the problem of sorcery as they saw fit. Another scholar, Marie Therese Fogen, notes that the Christian Empire had achieved a state of detente with the use of magic: in a theology that espoused the belief that divine justice would prevail in the end, any gains made through the use of sorcery were ephemeral. Therefore, the sorcerer's control over demons was a short-term problem, since all of his or her ambitions would be thwarted in the long run. Even as Byzantium declined and became a ghost of its former self, it was still dangerous for practitioners of the hermetic arts. Author and theologian John Opsopaus, writing on the subject of Pythagorean and Orphic traditions, mentions the Byzantine occultist George Gemistos, who lived in mid-14th century in the Pelopponesian city of Mistra. Gemistos' compilation of Chaldean and Zoroastrian lore, known as the Book of Laws, came into the possession of the Patriarch Gennadios, who ordered its destruction. Although fate was kind to the Greek occultist, since fragments of his work have survived to this day. The advantage that historical novelists have over the writers of non-fiction chronicles is being able to persuade the reader as to the thoughts that were actually in the heads of the great men and women of ages past, and it is a device that will be employed here to a small extent. The year is 1300--a full seven centuries ago--and the hot air of summer bears down on Palestine as desert winds blow dust in the air. A special kind of dust, for it is an admixture of desert sand and the ashes of the armies, Christian and Moslem, who fought over control of this land during the previous two centuries in the wars we have come to know as the Crusades. A man, wearing armor covered with a surcoat bearing a cross, looks out the window at the desolation that is the holy city of Jerusalem from his vantage point at the massive pile of stone known as Solomon's Temple. His name is Jacques de Molay, and his task is daunting. Since his election as Master of the Templar Order eight years earlier, Molay, a tactician and strategist who rose through the ranks of the warrior-monks to become a general, had achieved what in a later age--one with better communications--would have been hailed as one of the great achievements of all time. For the Crusades were over: the last remains of the Kingdom of Jerusalem, bravely defended for over two hundred years, had just been swept into the ocean by the Mameluke Sultans of Egypt, bringing an end to European adventurism in the Middle East that would not be rekindled until the reign of Napoleon. The Crusader outpost of Acre had fallen in the year 1291 and the Knights Templar, sworn to defend the Holy Land, were now on the island of Cyprus--without a land to defend and without a mission. As chance would have it, the Templars would find an extraordinary ally in the Mongol rulers of what is now modern Iran, who were kindly disposed toward Christians and were enemies of the Mamelukes. The Mongol Emperor, without hesitation, placed thirty thousand of his troops at their service, and so it was that De Molay abandoned the isle of Cyprus to lead a veritable sea of warriors to reclaim the Holy Land. In December 1299, two huge armies--the size of which had never been seen before during the Crusader wars--squared off outside the Syrian city of Hims. Accustomed as we have become to sanitized, video-game warfare, it is fully impossible for us to fully imagine the din of battle: the clash of steel, the screams of the wounded and dying, and the rallying cries of both sides as Mongols and Mamelukes collided like waves breaking against reefs. De Molay's coalition, which aside from Mongols included Armenians, Circassians, Cypriot levies and Templar horsemen, heralded the late 20th century coalition against Iraq. The outcome of the battle was clear: half of the Mameluke army had been destroyed and the other half limped back to Egypt. The Mongol Emperor, Ghazzan, redrew the political map of Palestine back to its Crusader-age boundaries. The Templars and their allies surveyed the bleak landscape of ruined cities and villages, destroyed almost a decade earlier after the fall of Acre. The Mamelukes had sworn that no crusader would ever be able to reoccupy the land, and had done their best to make it so. It was Europe's turn now to send thousands of soldiers and colonists to reoccupy and rebuild. History shows us that this never happened: Europe was no longer interested in Palestine and the reoccupation of the Holy Land by Western forces lasted all of six months. But what happened during those six months? A foresighted military man like Jacques de Molay could have probably envisioned the futility. As he looked upon the ruined landscape, was he concerned about the chances of resurrecting the Crusader Kingdom, or calculating the Templars' next move? Is it entirely unreasonable to suppose, in our age of conspiracy thinking, that the Grand Master of the Templar order was perhaps more concerned about returning to the Temple Mount to retrieve something of great importance to the warrior monks? The possibility that the Templars retrieved the Ark of the Covenant from its secret resting place beneath the Temple Mount has been discussed elsewhere, but some researchers have looked into an even more tantalizing prize: recovering the rest of the Table of Solomon. Not much is known of this object beyond its name. Spanish author Jesús Callejo believes it to have been an enigmatic "magic mirror" made out of a combination of different metals, capable of revealing the location of any location in the world, as well as the "image of the seven climates of the universe", quoting the chronicles written by Ben Aben Al-Hakam. A fragment of this mirror, suggests this author, may have already been in Templar hands, and efforts were being made to recover the rest. And what would the Templars have done with this source of hidden wisdom? Some believe that the fragment in the hands of the warrior-monks was used in the confection of maps: perhaps the most precise maps ever crafted before the Industrial Age. With this advanced cartography, it would have been possible to navigate to distant lands beyond the confines of the Mediterranean...such as the Americas. Although historians usually have little patience for the myths that have developed around the Knights Templar and their supposed esoteric activities, it is nonetheless important to note that French esoteric writer Louis Charpentier suggested the possibility that the Templar Fleet, sailing either from La Rochelle on the French Coast or from Lisbon in Portugal, reached the Americas to retrieve gold from the Amazon and silver from the Mexican mines. Charpentier added that legends from the Yucatan Peninsula mention the arrival of "white men in large ships" who wore on their brows an insignia of "two crossed serpents". Known as chanes to the Maya, these strange arrivals imparted "great wisdom" to their priests. Charpentier argued that such transatlantic voyages were necessary to account for the enormous wealth of the Templar order, a wealth which, according to author Jacques de Mahieu, allowed the Templars to finance the construction of seventy churches and eighty cathedrals. European silver mines in Spain and Moravia, according to Louis Charpentier, had been nearly exhausted or damaged by crude mining techniques (such as the ruina montium employed by the Romans, who aimed and making entire mountains collapse), and silver veins in Hungary were still undiscovered. Most of Europe's gold had been hoarded by the Byzantine emperors and very little of it circulated until after the sack of Constantinople in 1204. But the Americas offered an abundance of these metals. Is there any proof of such visits? Argentinean engineer Fernando Fluguerto Martí seems to think so: the Grupo Delphos research team (www.grupoddelphos.com.ar) believes that an ancient ruined fortification on the summit of the aptly-named "Cerro El Fuerte", commanding the approach to Golfo San Matías (an Argentinean body of water well known to UFO researchers) constitutes proof of Templar occupation. Some of the surface stones give the appearance of having been dressed by stonemasons, and superimposed stones held together by mortar have also been discovered. Researchers were stunned, however, to find a slab of dressed stone engraved with a Templar cross. Ing. Fluguerto believes that "a series of enclaves may have existed in Patagonia which were established by some kind of Templar or proto-Templar order... There would have been at least three cities--a fortified port on the Atlantic, and another on the Pacific, both at the same latitude...". The Grupo Delphos researchers have linked their discovery to the Argentinean legend of a city filled with silver and gold somewhere in the Andean foothills--a cryptic reference, perhaps, to the source of precious metals sought by the Templars? There are other tangible suggestions of the Order's possible operations in the Americas: Massachusetts gives us the carving of an armed knight, bearing sword, shield and dagger, discovered in the town of Westward, and the controversial Newport Tower also rises in that state. The latter structure, according to explorer David Hatcher Childress, while usually associated to the Viking presence in the Americas, shows that the measurements employed in its construction correspond to the architectural knowledge of Western Europe. Other authors have remarked that many of the mines being worked today appear to have been exploited in the past by unknown operators--a possibility that suggests even further secretive activity at a time when European mariners had not yet ventured beyond the Azores. It is also curious that 12th century navigators heading out into the Atlantic were forbidden to sail beyond Cape Mogador on the Moroccan coast unless they took great care to fly the Templar cross on their sails--something which Christopher Columbus also did over a century later. Historians tell us that the Carthaginians would destroy any craft venturing beyond the Strait of Gibraltar, but did the Templars do the same to keep the secret of their wealth? The answer must lie, along with any victims, at the bottom of the sea. The High Middle Ages were probably one of the most dynamic and bloody periods in human history: even the casual perusal of a textbook on the subject gives the reader the impression that after a long period of lethargy brought about by the collapse of Rome and invasions of nomadic tribes out of Asia well through the 11th century, the Mediterranean world was ready to burst its shackles and begin the age of exploration, which was still to come. But perhaps this urge to explore the unknown was visible in the magical practices of the time, which already showed the transition from the theurgy of the Ancient World to the practices of Paracelsus, Cornelius Agrippa, John Dee and others.